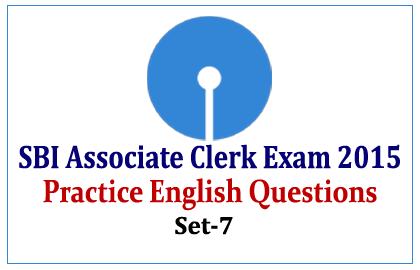 List of Practice English Questions for SBI Associate Clerk Exam 2015 were given below. Candidates those who are preparing for those exams can use these questions to score more marks. Directions (Q.1-10): In the following questions, a sentence has been given with some of its parts in bold. To make the sentence grammatically correct, you have to replace the bold part with the correct alternative given below. If the sentence is correct as it is, give 5) as your answer (i.e. No correction required). 1).She said that neither the flat nor itscontent was for sale? 2).It is high timethat we send the magazine? 3).My father forbade menot to go through the contents of his letter? 4).The SC ruled that any civil servant who exposes corruptioncannot be a subject to disciplinary proceedings? 5). Four men from kalian in Maharashtrahad been left to fight for the ISIS in June? Directions (Q.6-10): Each question below has two blanks, each blank indicating that something has been omitted. Choose the set of words for each blank that best fits the meaning of the sentences as a whole. 6).While technology plays a major role in the life of the modern man, the most important aspect becomes the ability to _____________ technology and___________ the data from all social infrastructures to create useful information for the well-being of the society. 7). Shimla’s celebrated Mall Road, the city’s most happening___________ zone all through the year, has ______________ as many ATMs as places to eat. 9).HRD ministry’s move to teach Sanskrit___________ of German in Kendriya Vidyalaya has stung their management, left students in the ___________and, of course, hurt the Germans. 10). A person ___________ the mountain is called the nominator and the person___________ it is the nominee.